Box Text: Edda is a young man whose youth is marked by a boring island life, but whose serenity is shattered when he meets a mysterious young woman named Kirika on the beach. He soon realizes his skill as an exorcist and becomes a hunter, weaving a remarkable journey that will ultimately pit civilization against nature. Control your characters in real time. Perform combos, equip items and magic. *Improved Card and Guild System. Collect cards from battle or events and equip up to 4 kinds of cards to perform diverse attacks. *Play Online in Real Time. - Match mode. Battle with up to 8 players (4 vs. 4). - Co-op mode. Proceed through missions in teams of 4, look for rare cards by defeating enemies in dungeons (online-exclusive missions are included), and chat live. *24 Characters From the Arc The Lad Series. Defeat your enemies, collect items and magic to build your character. 07-19-2014 kwisatzhaderach Box Text Edda is a young man whose youth is marked by a boring island life, but whose serenity is shattered when he meets a mysterious young woman named Kirika on the beach. He soon realizes his skill as an exorcist and becomes a hunter, weaving a remarkable journey that will ultimately pit civilization against nature. *First Action-Based Game in the Series Control your characters in real time. Perform combos, equip items and magic. *Improved Card and Guild System. Collect cards from battle or events and equip up to 4 kinds of cards to perform diverse attacks. *Play Online in Real Time. Take your single player character online: - Match mode. Battle with up to 8 players (4 vs. 4). - Co-op mode. Proceed through missions in teams of 4, look for rare cards by defeating enemies in dungeons (online-exclusive missions are included), and chat live. *24 Characters From the Arc The Lad Series. Defeat your enemies, collect items and magic to build your character. 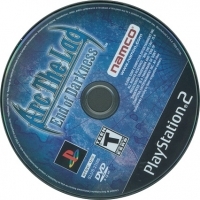 This is a list of VGCollect users who have Arc the Lad: End of Darkness in their Collection. 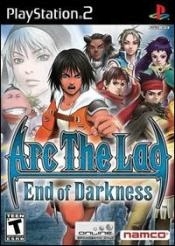 This is a list of VGCollect users who have Arc the Lad: End of Darkness in their Sell List. 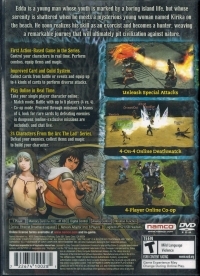 This is a list of VGCollect users who have Arc the Lad: End of Darkness in their Wish List.